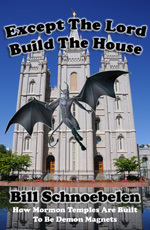 "Mormonism's Temple of Doom + 2012 Election Alert"
"Except The Lord Build The House: How Mormon Temples Are Built To Be Demon Magnets"
A secular reporter opined last week that if Mitt Romney made it to the White House in next year's elections, Mormonism would become a main-stream Christian religion and it would add several million new members to its rolls. My concern is not that a conservative Mormon would replace the socialist now occupying the White House, but that a few more millions of victims would fall prey to the doctrines of demons that are the foundation of Mormonism and lost to God and given over to the devil. 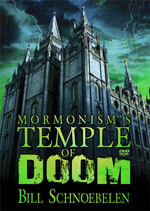 Cutting Edge note: Bill Schnoebelen, in his new DVD, “Mormonism’s Temple of Doom: 2012 Election Alert”, details many of the Mormon doctrines which are clearly “doctrines that demons teach” instead of the pure, unadulterated TRUTH of Scripture. Bill’s explanation is clear and insightful and easily understandable; he also weaves in this narration examples from the time he was a Mormon. “I was back East recently and was watching the News when one of the new LDS warm and fuzzy "we are just like you" ads came on and I was impressed by the quality and impact of the ad to a lost and dying world. Would that a few of the mega-churches spend a tenth of what the Mormons spend and reach out with the real Jesus to that same lost world. The problem is that for the most part, the Christian church has stopped inoculating its people against the warm and fuzzy demons of the cults. I have said many times that Satan is not going to come to you looking like a fourteen foot frog with bad breath. He is going to come as a sweet and enticing spirit. The late Dr. Walter Martin said that the cults are the unpaid bills of the Church and it has not been more so than today, when the vast majority of the churches, especially in the evangelical community, do not want to offend anyone. They seem to forget that Jesus, the rock of our salvation, offended a whole lot of folks, especially the religious ones. Funny. Jesus said, "Whosoever therefore shall confess me before men, him will I confess also before my Father." That's the deal I would want in on! Because of the lack of discernment so prevalent in the church today, men like Mitt Romney and Glenn Beck seem to captivate the hearts of many Christians, especially some of our most leaders. They seem to be able to casually trade their biblical integrity for the spotlight, standing with these ministers of deceit and openly accepting them as true Christian brothers, as though they were unaware that both Beck and Romney proclaim not the righteousness of the Living God, but their own righteousness as they work to become gods of their own planets. The Word of God warns us of this coming to pass in the last days. The other day, I watched Mitt Romney being interviewed by one of our most well known Christian TV personalities. This is a man with whom I have personally shared the dangers of the LDS doctrines. He knows the dangers. Yet this man who professes to have great spiritual discernment sat, knee to knee, with Mitt Romney, A Mormon High Priest wearing his magic temple undergarments, only inches from this great Christian leader who fawned all over this "strong conservative candidate." This last Sunday night, August 21, 2011, Carol and I turned on the TV to see John Hagee speaking on TBN, while at the Glenn Beck "Restoring Courage" event in Israel. TBN, another major player in Christian Television had dedicated its full broadcast power, without interruption to this mighty cause, led by the demonized temple Mormon, Glenn Beck. Now, let us talk about those “Secrets” which Mitt Romney does NOT want you to know. Mitt isn't JUST a member of the Mormon Church. Mitt Romney is a Temple Mormon, a High Priest, and as such he has sworn blood oaths of sacrifice, obedience, and consecration to the church and the soon coming, long prophesied "Kingdom of God." His belief in and obedience to these laws will allow him to become a polygamous god in the next life, the literal father of the peoples of a new and different earth. He wears secret undergarments marked with sacred talismanic symbols that he believes will keep him protected as he works his way to godhood. He is truly a Presidential candidate with an actual, definable god complex. This "Kingdom of God" is the actual Mormon Theocracy that will take over the U.S. government when the Constitution of the United States "hangs by a thread" and the nation is 'saved' by the Mormon Brethren, the LDS spiritual leaders. The prophet and the apostles and key Mormons in high positions, such as Mitt Romney sitting in the Oval Office. The money pouring into his campaign isn't accidental. It is to fulfill prophecy. Mitt Romney's strong candidacy for 2012 and his possible presidency has become a whispered ground swell of speculation in Mormon circles, as they wonder if he is the "one Mighty and Strong" who will usher in the last days and bring America into the LDS "Kingdom of God." These are the whispers that the Brethren hope do not become public but are laid wide open in this chapter. I have been following politics ardently since November 22, 1963, the day that President Kennedy was assassinated. My viewpoint was Conservative, Christian Republican, and I followed Conventional Wisdom until 1970, when I arrived at a Pentagon-level facility in Okinawa, as an analyst in the Army Intelligence Service. I was granted the highest clearance possible at that time, “Top Secret, Crypto”. 1) I knew I could not trust anything any government official said, as I caught them lying nearly every single day! 3) I knew that, on key bottom-line issues, both Democrat and Republican top leadership seemed strangely following the same goals. 4) I learned that public statements were usually misleading and seemed orchestrated, while the real business of Congressional governing occurred behind closed doors, away from the public spotlight. And, when matters of key importance emerged from behind those closed doors, leaders of each party were revealed to support an issue they had adamantly opposed just days earlier, and vice versa. In the mid-1980’s, as I began to research the New World Order and the fact that Daniel 10 and Revelation 17:14-17 were really true: in the heavenlies, Godly and ungodly angels were battling over the “ear of the human king”, trying to influence the future actions and plans of the human ruler. And, while God could win each battle, at the End of the Age, He has chosen to allow the demonic host the victory in time after time, as He forces Satan to create a plan which, when completed, will fulfill every single one of God’s prophecies. And, as Christian author, Constance Cumbey revealed in her books, “Hidden Dangers of the Rainbow” and “A Planned Deception”, a boldly written plan has been written within the books of occult authors which fulfills prophecy precisely. A former member of the House of Theosophy, told me that “a person could read 1,000 New Age books and not understand the plan to produce Antichrist, but he could read the right 10 books and understand the plan perfectly”. He studied those 10 books with me for over two years; in fact, while we were studying the last book, two more books were published, and since they were deemed to very important, we continued working together until we finished them. By the November elections, 1988, I concluded that the national elections were certainly manipulated to achieve the results which the Global Elite desired. My conviction to this effect has only increased over the years since then. In the presidential campaign of 2008, I concluded that Mitt Romney was running a campaign designed to place him in the leadership position in the 2012 campaign; in other words, Mitt was not persuing a strategy designed to win in 2008, but to win in 2012. My conclusion was that America was probably going to have a Mormon President in 2012. Thus far, events have transpired which prove this opinion correct. Please take a few moments to read Bill Schnoebelen’s treatise on the Mormon “White Horse Prophecy” so you can understand that, at the moment a Mormon is intensifying his run to the White House, events are cooperating to give him a most critical rallying cry, “Save The Constitution”! Remembering that Mormonism is just as Illuminati as is Skull & Bones, we might wake up the morning after the election to discover that Temple Elder Mitt Romney is the new President of the United States.